It should be no secret that dinosaur fossils are found all over the world, including the Arctic and Antarctic regions. Yon beasties sure did get around! This can be a problem for evolutionists, as they attempt to explain the apparent mobility of the dinosaurs. Not much of a problem for creationists who believe in a worldwide flood, however. 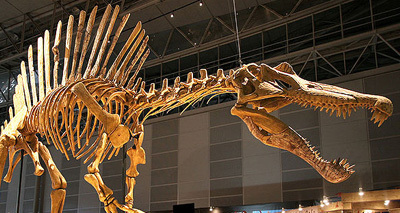 A spinosaur fossil found in the southeastern state of Victoria in Australia suggests dinosaurs were much more mobile than previously thought.The single fossil vertebra, unearthed in the 1990s, is identical to that of a spinosaurid called Baryonyx walkeri which was previously thought to only live in the northern European climes. Thus the original paper called it “the first Australian spinosaurid theropod dinosaur.” Most of this sounds like it is good, solid, scientific research. That is until the evolutionary explanation begins. To hear the tale of evolutionary explanation, read the rest of "Croc-nosed dinosaur bonesurprises researchers: Spinosaur fossil shows that dinosaurs got around, but how? ", here.